Home > Hinduism > Spirituality > Gurukrupayog > Chanting > How can one prevent other thoughts from occurring while chanting? 1. At Brahmamuhurt, (the auspicious time at dawn) the sattva component is more than at any other time of the day. Many yogis increase their sattva component through spiritual practice at that time. However the resultant increase in the sattva component is just 0.0001%. Hence there is no need to specially wake up at dawn and chant at the Brahmamuhurt. Rather than chanting with great effort at the Brahmamuhurt when one is sleepy, it is advisable for a seeker to choose a time according to his temperament, when chanting will occur at its best. Chanting The Lord’s Name raises the sattva component by as much as 5% compared to the mere 1% increase by chanting done when one is sleepy (as sleep is tama predominant). 1. Chanting in the temple, chanting using the proper seat, etc. increases the seeker’s sattva component by just 5% + 0.0001% for just 15 minutes whereas continuous chanting done anywhere increases it by 5% ; hence, the seeker chanting The Lord’s Name instead of paying attention to external things must concentrate on whether chanting is continuous or not. However chanting in a temple or a place of worship, taking a proper seat is necessary for the majority as they have a higher proportion of the raja component. Sitting in one place for sometime helps in reducing the raja component. Also since God Himself has created all places one can chant anywhere, even in the toilet. Changing the chanting according to one’s constitution proves to be beneficial. Some examples of this are given below. 1. Low blood pressure: Rapid chanting of a rajasik (raja predominant) Name of a deity with a rajasik temperament, for instance Shri Janardanaya namaha (श्री जनार्दनाय नम: ।). High blood pressure: Slow chanting of a sattvik (sattva predominant) Name of a deity with a sattvik temperament, for instance Shri Ganeshaya namaha (श्री गणेशाय नम: ।). 2. Exhaustion and boredom: One feels sleepy when one is exhausted and bored when the mind is fatigued. At such times one should not chant with great effort. 3. Menses: According to the Path of Devotion since the menstrual cycle too is God’s creation one can certainly chant even during menses. Since during menses the rise in the raja component is just 0.0001% it hardly affects the 5% increase in the sattva component generated by chanting. 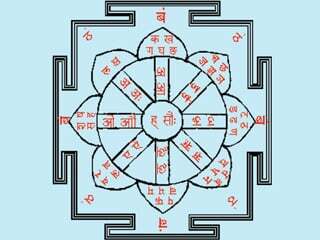 With appropriate pronunciation one can obtain benefits from the effect of that sound (nad) on the akash (absolute ether) element. This point is further illustrated in ‘Science of Spirituality : Chapter 10 – Path of Mantra (Mantrayoga); point 5. Pronunciation and its importance’. ‘Mere mechanical pronunciation of mantras is not deemed as chanting. The pronunciation should be such that the seeker should get endowed with divine emotion and divine power. Patanjali describes only such chanting as the emotion of a mantra. Just as dipping a substance in a solution time and again gives it a coating of that solution, so also with ceaseless emotion of the meaning of the mantra, the one chanting it should gradually merge with the mantra. This is the main motive of chanting. Shri Guru meets that seeker chanting the Name of The Lord who has an intense yearning for His vision. The seeker then asks, ‘Although Your Name destroys suffering why do I undergo it inspite of chanting ? ‘Then Shri Guru responds “If one undergoes suffering inspite of chanting the Name which has the capacity to reduce suffering then how can one say it destroys suffering ? So chant the Name of the Lord with faith; then your suffering will be overcome.” This means that one needs to have faith that Shri Sadguru will definitely uplift one no matter what one is. This itself is termed as complete surrender. The meaning: Those who surrender unto Me alone are able to cross this Great Illusion (Maya). Initially while chanting one does not have faith. If that is present it is sufficient. However when chanting, once The Lord’s Name culminates into faith, then whether one chants or not, it does not make any difference as by then all actions represent chanting. Yet due to the earlier impression one chants till one breathes one’s last. The only difference now is that the artificiality of chanting is lost and it occurs quite naturally. Then one acquires the knowledge of the Vedas. If one chants with devotion, it helps in making an imprint of devotion on the subconscious mind. Hence in the Path of Devotion one is asked to chant the Name of the benevolent deity (ishtadevata). As against this in some paths one is asked to chant meaningless letters like lam, tam, etc. Due to this not only does one acquire the other benefits of chanting but also since no impression of devotion is made on the subconscious mind ‘spiritual progress which means removal of all impressions from the subconscious mind’ can be achieved more easily. However, for a seeker in the primary stage to prevent boredom, chanting The Lord’s Name with devotion and spiritual emotion (bhav) proves to be beneficial. Just as sugar has sweetness as its quality, so also the nature of the mind is to think continuously or to harbour a certain emotion arising from some thought. In the beginning when chanting, everyone gets various thoughts due to the impressions from previous births. They are mainly due to doubts about chanting as well as due to the impressions on the subconscious mind. They can be reduced with the help of the following methods. One should bear in mind that to achieve concentration is the target and not the tool. Other thoughts gradually decrease with practice. Autosuggestions such as, ‘When my mind starts wandering while chanting I will become aware of it and will be able to concentrate on chanting’ should be given in a hypnotic trance or should be thought of 15-20 times before going to bed at night. This reduces the wandering of the mind considerably if done for four to six weeks. One should think of the deity or the Guru in the beginning and off and on during chanting. Due to the devotion unto Them, the wandering of the mind reduces considerably. When chanting with effort in the Vaikhari mode of speech (vani) several thoughts cross one’s mind due to the countless impressions of the previous births. These thoughts are related to the impulses arising from the five sense organs or the subconscious mind [Refer ‘Science of Spirituality : Chapter 36 – Path of Meditation (Dhyanyoga)’]. The following factors help in promoting continuous chanting. A. Pratyahar (introversion): Pratyahar means restraining contact of the senses with sense objects, for instance when the eyes are closed their contact with scenes is obviated; hence external stimuli do not reach the mind through the five sense organs. When this is achieved the mind does not get thoughts about them. B. External satsang (holy company): At a satsang one gets more thoughts about Spirituality; consequently other thoughts decrease. C. Spiritual love (priti) for others: This reduces pondering over one’s own problems. D. Chanting (internal satsang): Just as one thorn is removed with another so also the thought of chanting reduces other thoughts. 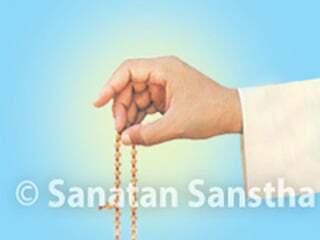 E. Faith (shraddha): The greater the faith in the Name the better is the chanting. When one has doubts about the Name, chanting decreases. F. Service of the Absolute Truth (Satseva): Due to concentration on the thought of service while carrying out service of the Absolute Truth and also due to the benefit of being in satsang ‘one either thinks about service or continues chanting’. G. Sacrifice: The more the possessions the more one thinks about them. This encompasses everything, one’s family, relatives, wealth, etc. One does not think about something which one does not possess or desire. Hence, the more sacrifice one is able to make the less are the thoughts that one gets. H. Reduction in the ego: The greater the ego the more one thinks about oneself. The lesser it is, the more one can contemplate on chanting. I. Obeying the Guru’s orders: Obeying the Guru’s orders assists the dissolution of the intellect. J. The Guru’s grace: One cannot restrain completely thoughts generated in the mind merely with one’s own efforts. The Guru’s grace is the only means to achieve this end. The following table illustrates the spiritual level at which the above factors can be achieved by a seeker and their comparative importance. In a way faith, reduction in ego and acquiring the Guru’s grace are the targets and the others are the tools. Day-to-day life and continuous chanting: Many people feel that by continuously chanting The Lord’s Name, day-to-day life will become difficult. They wonder as to how it is possible ‘to converse with others, work in an office, cross the road without meeting with an accident, etc.’, when the mind is engrossed in chanting. These doubts are ill-founded. Usually when crossing the road, though one looks out for traffic on all sides, hears the sound of cars, etc. conversation with others or thinking continues and one can still cross the road without meeting with an accident. Similarly, one can also perform all activities inspite of chanting. A. If one has been chanting the Name of some deity, before meeting the Guru and thereafter the Guru advises to chant another Name, then due to the divine consciousness (chaitanya) in the Name imparted by the Guru, the Name chanted earlier automatically stops after sometime. Until this happens one should also make conscious efforts to stop it. B. Even though one realises the importance of the family deity’s Name, one has to make efforts for atleast five to six months to stop chanting the other Names since one remembers the earlier Names which one is so used to chanting. There is no need to fear that if one stops the Name chanted previously then that deity will be enraged. On the contrary the former deity too gets appeased, since one is doing the appropriate spiritual practice. C. One should start chanting the Name of the family deity or that imparted by the Guru along with the old one. After sometime one will experience Bliss due to the new Name. Hence, that Name itself will continue. One remains alive due to breathing, not due to the Name. Therefore, it is important to concentrate on the breath and synchronise the Name with it. Breathing should not be synchronised with the pace of the chanting. A. Reduction in undesirable thoughts: Nowadays the environment is polluted (with undesirable thoughts), which causes psychological problems as these undesirable thoughts enter the mind with the breath. Other thoughts too enter the mind along with them. When one synchronises chanting with breathing, the proportion of such thoughts gets reduced and one gets a unique experience of Bliss. B. Living in the present: Concentrating on the breath results in grappling with the particular moment of the present. On the other hand, entertaining any other thought amounts to thinking of the past or the future. Since it is important for a seeker to always remain in the present it is necessary to concentrate on the breath. C. Continuous chanting: Since respiration continues for twenty-four hours it facilitates continuous chanting. D. Progress towards non-duality (advait): When chanting, even though one gets a vision of God due to the spiritual emotion (bhav), duality persists. Contrary to this, when chanting is done along with the respiration, due to devotion unto The Lord’s Name there is no vision of God, but the seeker who chants progresses towards non-duality (advait) right away, that is blends with The Lord’s Name. One may commence by chanting for five minutes and increase it by a minute, periodically. Later, chanting occurs for several hours and finally occurs continuously. This is referred to as chanting without the ten sins; without the sixty-four sins, etc. Behaviour contrary to the raja-tama constitution means behaviour without sins. In the Padma Puran, the Sanatkumars have narrated to Sage Narad the ten sins associated with chanting as given below. B. Considering the Names, forms and qualities of (deities such as) Vishnu and Shiva to be distinct from one another. 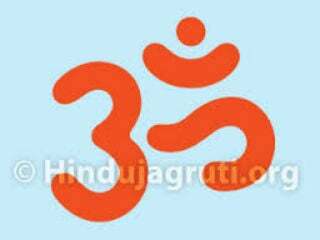 D. Criticising holy texts such as the Vedas, Shastras (scriptures), Purans, etc. E. Considering the glory of The Lord’s Name to be a mere exaggeration, in order to create a liking for chanting. F. Performing bad deeds in the Name of God. G. Considering holy actions such as vowed religious observances (vrat), offerings (dan), sacrificial fires (yadnyas) to be equivalent to the chanting of The Lord’s Name. H. Earnestly preaching about chanting of The Lord’s Name to one who has no spiritual emotion (bhav), faith or any desire to listen to spiritual discourses. I. Not having faith in The Lord’s Name despite realising its glory. J. Getting engrossed in defects such as egoism, selfcentredness, etc. The above ten sins are prohibited in chanting. The seeker should avoid them. Otherwise his spiritual practice is wasted in nullifying them and spiritual progress is blocked, for instance thirty malas of chanting are wasted with one abuse, 500 malas are wasted with the acceptance of a bribe. Chanting may be increased stepwise in the following way. For every step, depending on the seeker’s spiritual level one may require a period of six months to two years. A. One should chant atleast three turns of the mala or do chanting for ten minutes daily. B. One should chant when one is idle. C. One should chant when performing physical activities such as bathing, cooking, walking, travelling in a bus or train, etc. The day-to-day chores are done by force of habit. One does not need to think while performing them. This makes it possible to chant during physical activity. D. One should chant while performing mental activities which are not important in day-to-day life, like reading the newspaper, watching television, etc. Such tasks are done by the eyes. Hence at such times one can chant mentally. 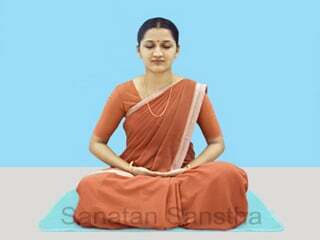 E. One should chant while performing mental tasks which are important in day-to-day life, like reading or writing official papers. When doing such tasks the eyes, intellect and hands are active so one can chant mentally. F. One should chant when conversing with others. How one can chant continuously when performing any other activity will be clear from the following discussion. Each one can focus one’s attention on eight things (ashtavadhani). These eight points of concentration are through the five sense organs (1. ears, 2. skin, 3. eyes, 4. tongue and 5. nose which are referred to as the external sense organs), 6. conscious mind, 7. subconscious mind (chitta) and 8. intellect (these three are the internal sense organs). The organs perform their respective functions, for instance if an individual is crossing a road then he looks at the traffic around, listens to the sound of vehicles, becomes aware of some odour on the road or of being touched by someone, all at the same time. Thus while the sense organs are operational an individual thinks of some task, intellectually takes a decision about that task and is simultaneously reminded of another task to be performed. In this way, every individual possesses the eight-fold concentration in the subconscious mind. Since every organ can perform its own function, when reading the newspaper the eyes and intellect function while the mind chants. In stages 5 and 6 chanting does not refer to verbal chanting but symbolises the Bliss experienced while breathing or chanting The Lord’s Name. Once this occurs, chanting continues even in sleep, that is it occurs continuously for twenty-four hours. A. The Gayatri mantra: The Gayatri mantra is a spiritual practice of the tej (absolute fire) element whereas chanting the Name of the family deity is that of the pruthvi (absolute earth) element. If one performs the spiritual practice of the tej element before that of the pruthvi element, it could result in distress. This is like appearing for a graduation examination directly without clearing the matriculation examination. However if the Guru has recommended the Gayatri mantra then one should certainly chant it. B. Women chanting with the usage of Om: Refer ‘Prefixing Shri or Om to the Name’. ‘Dr. Jayant Balaji Athavale: Sometimes instead of listening to Your speech my concentration turns towards chanting. If this happens there may be inattention to a certain task one might have been asked to do. To avoid this should I stop chanting the Name and instead listen to what You are saying? The seeker in the primary stage becomes vain that ‘since I am chanting The Lord’s Name, I am more evolved than those who do not’. This loss is possible in all seekers and to prevent it one should constantly harbour the spiritual emotion that ‘without the grace of the Guru or The Lord, I will not be able to chant The Lord’s Name’. Distress caused to a seeker due to chanting of the wrong Name and due to distressing energy: See ‘The effects of Names of certain deities’. Ultimately all sacrificial fires (yadnyas) get converted into the sacrificial fire of chanting (Namayadnya). The conversion of the routine sacrificial fire into that of chanting The Lord’s Name implies that one has blended with one’s soul principle (atma). If such a seeker does not perform any sacrificial fire it does not matter at all. Since the sacrificial fire of chanting is a manifestation of The Lord, it is termed as superior devotion (parabhakti). Superior devotion is devotion consisting of love akin to that of the wives of the cowherds (gopis) unto The Lord. It is also termed as the non-Vedic spiritual practice of love. That plane is such that, in it non-parabhakti spiritual practice such as a sacrificial fire proves to be an obstacle, a blemish. Also since one is overwhelmed with devotion one has no consciousness of one’s body and blends with the inner Bliss. A. A word, touch, form, taste, odour and its energy coexist. Hence if chanting (the word) increases then one gets a vision of God (Sarup Mukti). At first, during chanting one gets a vision of God (darshan) during meditation and experiences Bliss. Then, when this yearning becomes intense one gets a vision in a dream and acquires The Lord’s blessings. Later one gets the actual vision in the waking state. The waking state is sattvik (sattva predominant), the dream state is rajasik (raja predominant) and the state of meditation is tamasik (tama predominant) in nature. Hence devotion should get transformed into obtaining the vision of the manifest form (sagun darshan) in the waking state. The meditative state of a seeker is more sattvik than the waking state of an average person. However, in case of a seeker the meditative state which gives the corpse-like experience (mrutavastha) is tamasik in nature as compared to the waking state experienced in the natural state of communion with God (sahajsthiti) which is sattvik in nature. B. The qualities (energy) of the deity which has granted a vision (darshan) are imbibed in the seeker. C. There is a oneness with the deity granting the vision (Sayujya Mukti): If one is a highly evolved seeker then one experiences the unmanifest (nirgun) along with the vision of the manifest that is one’s devotion or mission after Self-realisation (dnyanottar bhakti or karma) commences in its true sense and one starts blending with The Supreme Brahman (Parabrahman). As long as one experiences the states of waking, dream and deep sleep during chanting, chanting does not occur in its real form as these three states belong to the intellect. 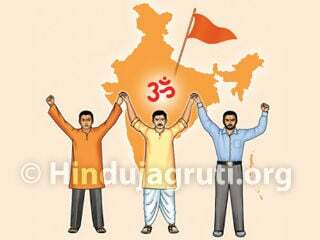 Only when these states come to an end through chanting, that is only when one enters the fourth state (turya) which is beyond these three, does one experience that ‘I am Brahman’. This is called the natural state of communion with God (sahajavastha) or Liberation from the cycles of birth and death (jivanmukti). One should chant with the conviction that one will realise God in this very birth. After Self-realisation chanting becomes one’s second nature. It occurs automatically, like respiration. This is termed by Saint Tukaram Maharaj as ‘when there is devotion unto Liberation chanting of the Name of Lord Narayan occurs continuously’. See table ‘Comparison of chanting in the four modes of speech’. The Teachings of Saint Bhaktaraj Maharaj. Compilers: Dr. Jayant Balaji Athavale and Dr. (Mrs) Kunda Jayant Athavale. 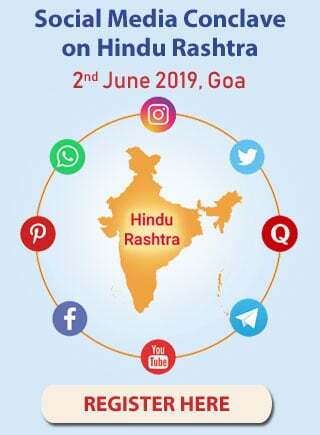 Publisher: Sanatan Bharatiya Sanskruti Sanstha. 5,6. Shri. Brahmachaitanya Maharaj Gondavlekar Yanchi Pravachane. Publisher: R. B. Ghanekar, Secretary: Shri Sadguru Brahmachaitanya Maharaj Gondavlekar (sansthan), Chaitanyopasana, Post Gondavale Budruk 415 509, Taluka Man, District Satara. Spiritual emotion of being in an observer state. Natural state of communion with God. To retreat (In Yoga - withdrawal of the sense organs from the sense objects).